Located in Bexar County Texas, Helotes is considered a part of the San Antonio-New Braunfels Metropolitan Statistical Area. Helotes became an incorporated city in October of 1981 and has been fighting a losing battle ever since to keep its small town vibe. Businesses and residential communities are popping up everywhere as more people move to San Antonio and discover charming Helotes. Old Town, located in Helotes is a revitalized little area which includes several local businesses and shops. The heart of Helotes and Old Town is the legendary John T. Floore’s Country Store which was opened in 1942 by Mr. John T. Floore as a unique Texas Dance Hall and Cafe. It has seen the likes of Elvis Presley, Bob Wills, Bob Dylan, George Jones, BB King, and many more amazing musical acts in its 70 years. 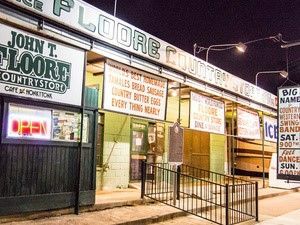 Floore's is also considered the musical "birthplace" of Willie Nelson. Floore’s is renowned for its world famous tamales and its homemade bread and offers “Texas Cafe” style food in a truly unique “Texccentric” atmosphere. A huge annual tradition in Helotes is the Cornyval Festival which brings in various local vendors and lots of area residents to celebrate the namesake of the town. The name of the town is based on the spanish word “elote” which means “ear of maize”, corncob or simply corn. Helotes is also home to the Oak Valley Golf Course which was developed by the Lorenzo Morales family. There are also other shopping centers located off Bandera Road which is the major thoroughfare. A large variety of shops, restaurants and entertainment with some major box stores. Helotes is served by the Northside Independent School District which includes Los Reyes Elementary School, Charles L. Kuentz Jr. Elementary School, Helotes Elementary School, Bob Beard Elementary School, Dean H.Krueger Elementary School, Hector Garcia Middle School, Wallace B. Jefferson Middle School and Sandra Day O’Connor High School. Local statistics: population (2014): 8,364 (96% urban, 4% rural). Population has increased +95.2% since 2000. Median age of the residents is 44 years old. Crime in Helotes is lower than the national average and unemployment is also lower in Helotes than in the rest of Texas as provided by city-data.com. Housing in Helotes ranges from the moderately priced $200,000’s to the luxury priced at over $1,000,000. New construction is available as well as existing resale opportunities. Check out the search below to see the newest listings.